Marigolds' Loft: A Little Addicted? Do I look a little addicted to you? Yes, I guess I would look that way to myself too. This is another box of yarn which arrived this morning. After putting together the Secret Santa Exchange post and realizing that we only have 13 weeks to Christmas, I thought I better start cracking on with handmade gifts if I wanted to have any under the tree. Until this year, I actually have stayed away from putting things under the tree as it just seemed like too much stress. This year though, I came across a couple of projects that seemed to be very fitting for the occasion and so I decided to jump the gun and get the yarn I needed to start getting things complete in time. Whether or not I will succeed at this quest remains uncertain, but for the moment all other WIP have been put on hold. I did finish the first of my Tardis socks for Jas and hope to get the other finished or at least close to finished by next week - it is a little difficult as she is on holiday at the moment and these are a Christmas gift so I am trying to find little pockets of time when she is not around to progress on them. I did accomplish two-at-a-time on the magic loop and have started to knit some gloves for myself and plan on knitting each family member a pair in time for the cold. I love the thickness of this yarn, which makes for a quick project! These are part of the Craftsy Course I started a while ago, and I am enjoying getting back into it again. So nothing for it other that to weave. I am over halfway on this project and hope to be finished with it shortly so that I can get going on my other project for under the tree. I can't wait to get this project off the loom as it seems to be going on forever. Not my finest work, but I don't have the heart to just remove it from the loom! Yesterday I was able to purchase my new machine WOOT, WOOT!! Unfortunately, I won't have any time this week to try her out as I have a market on Saturday and am needing to complete all my goodies that I am taking to sell. It incorporates your hobby (crochet/knitting/sewing/embroidery) and books! I wish you all a great rest of your week. P.S. 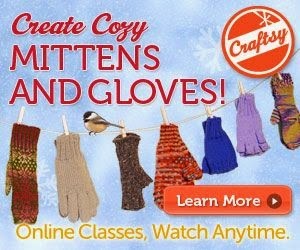 This post contains affiliate links to Craftsy which help with the upkeep of my blog. I thank you in advance for using them. Oh I've seen the tardis sock pattern! Clever you! I'm terrified of colour-work... I might have to bite the bullet for a bit of awesome Whovian stuff.